Another 737-800 tailstrike on landing report just published. This one was interesting because the visibility was 1400m in shallow fog so the crew elected to perform a dual autopilot approach, disconnect at 161ft RA and land manually. PF was trimming in the 14s flare, the speed dropped to Vref -10 and the pitch increased accordingly until the tailstrike. There were no calls from PM throughout the event. On 14th January 2015, M/s Jet Airways Boeing 737-800 aircraft VT-JGE was involved in a serious incident at Kolkata Airport. The aircraft was scheduled to operate flight number 9W615 from Mumbai – Kolkata- Bagdogra. While carrying out landing at Kolkata airport, aircraft suffered tail strike. The aircraft was under command of PIC having ATPL and Co-pilot CPL. There were 144 passengers, 06 Cabin crew and 02 ACM on board the aircraft. The aircraft took off from Mumbai at 0141UTC and the flight from Mumbai to Kolkata was uneventful till touchdown. Visibility at the time of landing was 800 m and ATC assigned Runway 19 L. PIC decided to carry out dual auto pilot approach with the intention of carrying out a manual landing.During landing at 0340 UTC aircraft touched down with a pitch of 5.1 ° and speed Vref -10 kts. The flare lasted for about 14 seconds and the aircraft pitch reaches 9.14°. The fuselage and tail skid contacted the Runway. During the post flight walk around inspection by the AME, damages were noticed to tail skid and scrapping of aft belly of the aircraft. There was no fire or injury to person on board the aircraft. Ministry of Civil Aviation vide order No. AV 15018/150/2015-DG dated September 2015 constituted a committee of inquiry to investigate the cause of the Serious Incident under Rule 11 (1) of Aircraft (Investigation of Accidents and Incidents), Rules 2012. The committee consist of Sh. Amit Gupta Deputy Director-AED, DGCA as Chairman and Mr. N S Dagar Jt. GM (ATM), AAI as member. On 14th January 2015, M/s Jet Airways Boeing 737-800 VT-JGE was scheduled to operate flight number 9W615 from Mumbai – Kolkata- Bagdogra. The crew consisting of a PIC having ALTP & Co-pilot CPL and 06 Cabin crew. It was the first day of a work cycle for the pilots. There were 144 passengers (139 Adults + 3Child + 02 Infants) and 02 ACM on board the aircraft. The aircraft took off from Mumbai at 0141UTC and the flight from Mumbai to Kolkata was uneventful till touchdown. The approach was normal and PIC at 6000 feet requested ATC (approach) for high speed descend. ATC allowed high speed descend and assigned Runway 19 L for landing. Landing Flaps were selected as 30°. However, there was discussion by PIC with co-pilot regarding Flap position to 40°. Visibility at the time of landing was 800 m and the crew decided to carry out dual auto pilot approach with the intention of carrying out a manual landing. V approach was 153 kts & V ref was 148 kts. The landing was carried out by PIC and co-pilot was monitoring the instruments. During landing at 0340 UTC aircraft touched down with a pitch of 5.1° and speed Vref -10 kts. The Flare lasted for about 14 seconds (from 30 ft to MLG touchdown) and the aircraft pitch reached 9.14°. Aft fuselage and Tail Skid contacted the Runway. G recorded during touchdown was 1.36. On landing the aircraft taxied to the bay on its own power. Passengers and crew disembark from the aircraft normally. During the post flight walk around inspection by the AME, damages were noticed to tail skid and aft belly of the aircraft. There was no fire or any injury to person on board the aircraft. The aircraft sustained the following minor damage. Rubbed mark of approx. 70" long found on fuselage bottom side between STA 867 & STA 967 and between Stringer 27 L & 27 R.
Rubbed mark at Frame 1016 (from 18" forward FR1016 to 18" aft of FR 1016). Paint peeled off and 2 deep longitudinal gauges of approximately 9"length ahead of FR 1016. Tail Skid Cartridge core assembly damaged (shortened by 0.5"). 07 Rivets sheared off at STA 967 and between Stringer 27L & 27 R.
Stringer clip at STA 907 and STA 887 at Stringer 27L bend. Deep Gauges of Length 44.5" between STA 867 and STA 927 Stringer 27 L & 27 R.
Bulge of fuselage skin of 3.5" aft edge of frame STA 867 between Stringer 27 L & 27 R.
The Airport Reference point is 223914.2N, 0882648.18E. Runway has marking for Designation, THR, TDZ, Centreline, Rwy Edge and is lighted for THR, Edge, End, TDZ, and Centreline. The Airport Rescue and Fire Fighting Services is Category ‘9’ (Nine). Apron has parking capacity of 01 code F, 16 code E, 6 code D and 36 code C aircraft respectively. Autopilot was disconnected after Minimums warning and PIC was adjusting Stabilizer trim during landing. PIC after landing mentioned to co-pilot that the runway surface was not good. Co-pilot informed PIC that during landing aircraft was bouncing up & down. There was no mention / recording of Co-pilot monitoring the aircraft attitude and speed during landing. Autopilot was disengaged at 161ft RA and aircraft was landed manually. The aircraft flare lasted 14 seconds (from 30ft to MLG touchdown). Distance from Threshold to touchdown approximately 1200m. Aircraft touched down with a pitch of 5.1° and speed of Vref (-10) Kts. Four seconds after touchdown the pitch increased to 9.14 ° when the tail strike occurs at this point. G recorded at touchdown was 1.36. As per the DFDR readout the aircraft flare was for more time. Due to the late autopilot disengagement PIC did not have adequate time to apply sufficient nose down trim to counter the bias added by the autopilot. The DFDR and CVR audio confirm small amount of nose down trim applied after autopilot disengagement and prior to flare. The FCTM extract below indicates a flare time of 4 to 8 seconds for a normal landing whereas this landing flare of VT-FGE lasted 14 seconds. This may have been influenced by the PIC attempting a smooth landing. Speed at touchdown was 138kts which was 10kts below selected Vref (148kts). With the lower speed the aft body clearance is reduced thereby increasing the risk of tail strike. PIC at 6000 feet requested ATC (approach) for high speed descend which was approved by ATC. DFDR reveals a maximum vertical speed of 1095 feet/min during high speed descend between 6000 to 3000 feet. The landing was carried out by PIC at Runway 19L. As visibility was less, PIC engaged both Auto-pilots at Radio Altitude of 2088 feet. Autopilot was disengaged at 161ft RA whereas as per As per Boeing FCTM it is recommend to disengage autopilot at approximately 300 to 600 feet AFE if a manual landing is planned. This allows the pilot to establish airplane control before beginning the flare. During dual mode autopilot approach, stabilizer trim automatically added nose up and this needs to be compensated for if the crew takes over manually. PIC applied small amount of nose down trim after autopilot disengagement and prior to flare. The flare lasted for 14 seconds and aircraft touched approximately 1200m from threshold .As per FCTM a flare time of 4 to 8 seconds is for a normal landing .The speed at touchdown was 138kts, which was 10kts below selected Vref (148kts). The aircraft touched down with a pitch attitude of 5.1°. However after three seconds the attitude increased to 9.14 ° when tail strike occurred. 1) The certificate of Airworthiness, Certificate of Registration, and CRS of the aircraft was valid on the date of incident. The aircraft was certified and maintained in accordance with prescribed procedures. There was no evidence of defects or malfunction in the aircraft which could have contributed to the incident. The flight crew was certified and qualified to conduct the flight. They had undergone the requisite pre-flight medical examination and were certified as not being under the influence of alcohol. The CG of the aircraft was within the prescribed limits. All navigation and approach aids were functional and were operating normally at the time of incident. The PIC had a total flying experience of 5248:10 hrs of which 1583:24 hrs were as PIC on type. Co-Pilot had a total flying experience of 4932:46 hrs and 4557:00 hrs as P2 on type. As visibility was less, PIC engaged both Auto-pilots at Radio Altitude of 2088 feet. Autopilot was disengaged at 161ft RA whereas as per as per Boeing FCTM autopilot to be disengaged at approximately 300 to 600 feet AFE if a manual landing is planned. This allows the pilot to establish airplane control before beginning the flare. During dual mode Autopilot approach, stabilizer trim automatically added nose up and this needs to be compensated if the crew takes over manually. PIC applied small amount of nose down trim after autopilot disengagement and prior to flare which was not adequate. The flare lasted for 14 seconds and aircraft touched approximately 1200m from threshold. As per FCTM a flare time of 4 to 8 seconds is for a normal landing. Speed at touchdown was 138kts which was 10kts below selected Vref (148kts). The aircraft touched down with a pitch attitude of 5.1°. However, after three seconds the attitude increased to 9.14°. The landing technique used by PIC resulted in more time during the flare which lead to a touchdown with a speed of Vref -10 kts and pitch angle increased from 5.1 ° to 9.14° leading to tail strike. The co-pilot failed to monitor the instrument references and callout of pitch attitude during touchdown, which resulted in a tailstrike during landing. 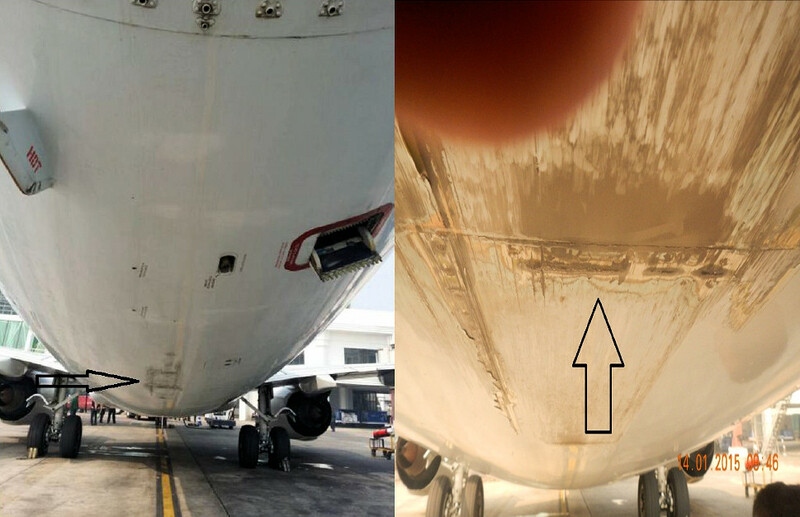 During the post flight walk around inspection by the AME, damages were noticed to tail skid and scraping of belly of the aircraft. There was no fire or injury to persons on board. During the last 4 years there has been more than 3 cases of tailstrike during landing occured to other airlines.